Last week, Mallinckrodt announced that it will sell its Nuclear Imaging business to IBA Molecular. Mallinckrodt provides approximately 40% of the U.S. supply of molybdenum-99 (Mo-99) in the U.S. and about 25% of the world supply. The impending acquisition made me think about the future of Mo-99 supply in the U.S. market, and the cost of technetium-99m (Tc-99m), which is used in 80% of nuclear medicine procedures. The U.S. consumes approximately one‐half of the world’s supply of Mo‐99. Over the years, there have been frequent supply interruptions, which have impacted adversely the quality and cost of patient care. 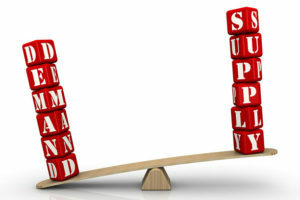 According to the SNMMI survey from Oct. 2014, the tenuous supply of Mo-99 in recent years has resulted in a double-digit price increase at many nuclear medicine facilities across the U.S. Producers such as Mallinckrodt make an effort to stabilize the global supply but this comes at a cost. In letters to their customers, Mallinckrodt has been communicating the significant cost drivers in the Mo-99 production that have necessitated the price increases over the last few years and into the coming years. To be sure, there are good reasons for the cost increase. One is the requirement by the American Medical Isotopes Production Act (AMIPA) to convert from High Enriched Uranium (HEU) to non‐HEU/Low Enriched Uranium (LEU) of Mo‐99 production by 2020. Beyond the conversion outlay, Mo-99 production using LEU has been inherently more costly than using HEU. Another reason is that the Mo-99 production costs have risen due to increased irradiation charges and Full Cost Recovery (FCR) models implemented by reactor operators. All these additional costs could not be absorbed by the Tc-99m generator manufacturers, and prices of Tc-99m have been rising. The trend is likely to continue upward, which will inevitably increase the cost of a unit dose. What are the imaging facilities to do, caught between the need to deliver high-quality patient care and the need to do it cost-effectively? Many facilities find that opting for technology that allows for reduced injected dose while delivering high-quality images has made them less vulnerable to the price fluctuations and more confident in their ability to provide uninterrupted service. Deborah Heart and Lung Center in Browns Mills, N.J. delivers high quality inpatient and outpatient services for the diagnosis and treatment of heart, lung and vascular disease within the Deborah service area. As part of its services, the Center provides a variety of specialized cardiac imaging, including nuclear medicine imaging. Earlier this year, Deborah has installed UltraSPECT’s Xpress3.Cardiac image reconstruction solution as part of Deborah’s radiopharmaceutical supply agreement with Nuclear Diagnostic Products (NDP). NDP supplies high-quality diagnostic and therapeutic radiopharmaceuticals and offers UltraSPECT products to facilities looking for a cost-effective solution to achieve faster and safer imaging while enhancing their diagnostic capabilities. Xpress3.Cardiac allows for significantly reduced injection doses and reduced scan times. In addition to minimizing patient exposure to radiation, both reduced scan time and reduced doses lowered the radiation exposure to Deborah’s technicians, as was conveyed in their dosimetry reports. Specifically, the total difference in exposure levels between Q2 of 2015 and Q2 of 2016 for the department that included five nuclear medicine technicians, a cardiology technician and a Stress Supervising NP is detailed in Figure 1. Discussions on protecting the patient from radiation during imaging tests abound in the mainstream media and the medical community. Ironically, we pay less attention to how imaging professionals are affected by radiation, even though they are exposed to it multiple times a day over the life of their careers. Is it because the focus is on the provider's critical role of healing and saving lives? Is there a perception that providers are somehow invincible? One study investigated the exposure of nuclear medicine techs to radiation during myocardial perfusion (MPI) scans. The study compared radiation exposure during a typical rest-and-stress scan with scans that used stress-only protocols together with UltraSPECT's image reconstruction technology. A stress-only protocol obviates the resting MPI dose, and UltraSPECT's WBR software allows for reduction of injected activity (low-dose protocols) with preserved image quality. The study, "Low count density cardiac SPECT software and stress-only protocols significantly reduce technologist radiation exposure" done by Xiaosun Zhou MD. 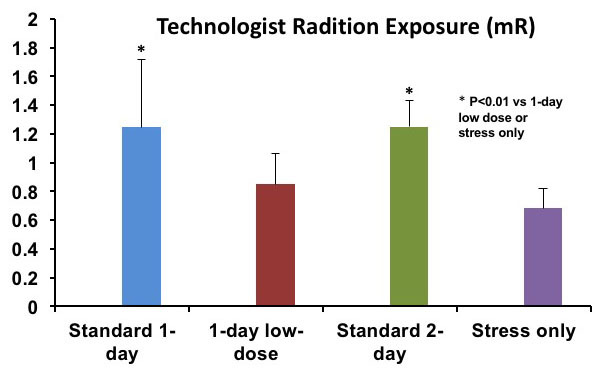 PhD., at el., Icahn School of Medicine at Mount Sinai, St. Luke's and Roosevelt Hospital Nuclear Medicine Department, showed that implementation of low dose together with WBR technology and a stress-only protocol can reduce the tech's radiation exposure by 27%-46%. Naturally, a lower injected dose also reduces the patient's radiation exposure. To learn more about the study, please email info@ultraspect.com or hit reply to the newsletter email.